Using propane in your Phoenix Metropolitan home or business provides you with a versatile and affordable option for creating heat and hot water. Propane is a versatile and very efficient method of creating heat thus lowering energy costs. Propane Servcies installs and delivers propane to homes throughout the Phoenix Metropolitan area. Should you pull the plug on your electric hot water heater? The installation of the propane gas lines can easily be handled by the experts at Propane Services. To learn more about our services, please visit Propane Gas Line Installation. Propane heated hot water heaters offer customers with an efficient and cost effective way to heat water for their home or business. Very few electric water heaters qualify for the federal Energy Star, where many propane hot water heaters, especially tankless, do qualify. It is estimated that 20% to 30% of the typical home's monthly energy expense go to heating water. The installation of a propane powered tankless water heater has the ability to reduce this part of the energy costs by up to 60%. 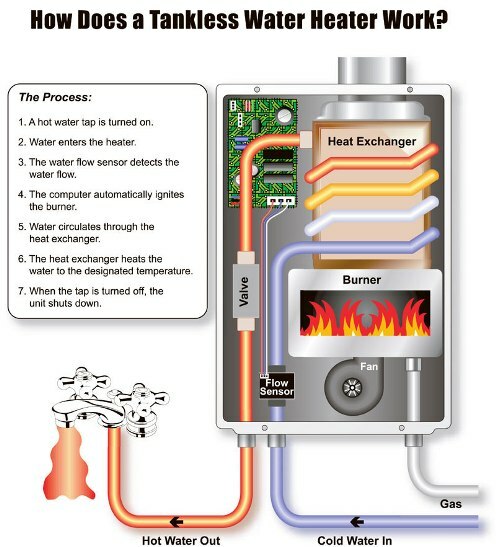 Also, a tankless water heater eliminates "standby losses" by only heating the water on demand. And, by not using a storage tank, tankless water heaters provide an endless supply of hot water, averaging about 222 gallons/hour. This results in substantial savings on your monthly energy bill. Your representative from Propane Services will be glad to discuss the benefits of propane heating and hot water solutions for your Phoenix metropolitan home or business. Propane is one of the safest and most reliable ways to provide heat and hot water for your home or business. Learn more at Propane Safety. To get answers to many of the common propane heating and hot water services that we offer, please visit our Frequently Asked Questions.